Class A, Class B, Class C, Class D, Class K and Multi-Class Rating. With the correct extinguisher, most fires can be brought under control within 2 minutes. Class A Fire Extinguishers will put out fires in ordinary combustibles, such as wood and paper. The numerical rating for this class of fire extinguisher refers to the amount of water the fire extinguisher holds and the amount of fire it will extinguish. Class B Fire Extinguishers should be used on fires involving flammable liquids, such as grease, gasoline, oil, etc. The numerical rating for this class of fire extinguisher states the approximate number of square feet of a flammable liquid fire that a non-expert person can expect to extinguish. Class D Extinguishers are designed for use on flammable metals and are often specific for the type of metal in question. There is no picture designator for Class D extinguishers. These extinguishers generally have no rating nor are they given a multi-purpose rating for use on other types of fires. Class K Extinguishers Dry and wet chemical extinguishers for kitchen fires. Due to the higher heating rates of vegetable oils in commercial cooking appliances NFPA 10, Portable Fire Extinguishers, now includes a Class K rating for kitchen fires extinguishers which are now required to be installed in all applicable restaurant kitchens. Once a fire starts in a deep fryer, it cannot always be extinguished by traditional range hoods or Class B extinguishers. Many extinguishers available today can be used on different types of fires and will be labeled with more than one designator, e.g. A-B, B-C, or A-B-C. Make sure that if you have a multi-purpose extinguisher it is properly labeled. Do you have questions or require service? We’re here to help! 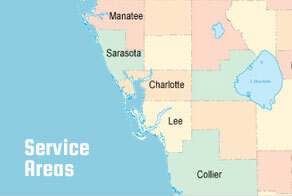 Call us today (239) 591-2929 or request a free quote.